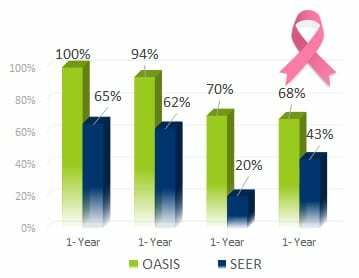 Oasis of Hope integrative cancer protocol, combines alternative and medical therapies proven to increase the patient’s success rates up to 3x times over the US national averages. 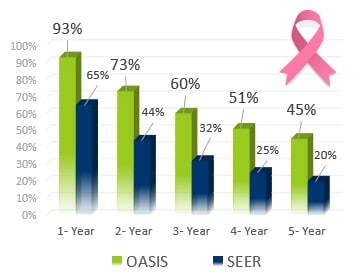 Breast Cancer Survival Rates when Oasis of Hope was the first treatment option. 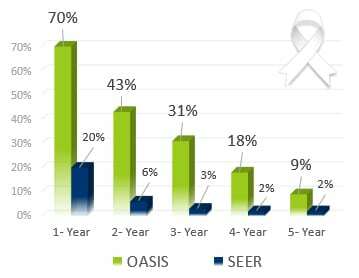 Breast Cancer Survival Rates when Oasis of Hope was the second treatment option. vs. the national averages tracked by the National Cancer Institute. Click here for more videos from Oasis of Hope alternative cancer treatments. Q : Can Oasis of Hope’s alternative cancer treatments cure my stage 4 cancer? 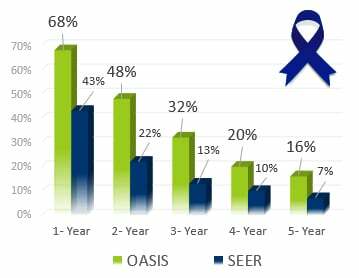 A : Alternative cancer treatments at Oasis of Hope have proven three times better results over conventional treatments from US national averages. Read more about Oasis of Hope survival rates here. Q : Are the alternative cancer treatments at Oasis of Hope approved by US health authorities? A : Oasis of Hope only employs the same US approved medical and alternative therapies. Additionally, doctors, surgeons and researchers at OOH are recognized by several US health authorities as important contributors to the advancement of cancer cure. Get to know our cancer doctors here. Q : How can I find out if an alternative cancer treatment is right for me? A : Oasis of Hope’s alternative therapies are complimentary treatments that do not interfere with any medical or other type of treatment already underway. These therapies are intended to increase the success rate while minimizing the damage. OOH also administers conventional medical therapies and other types depending on the patient’s needs. Request you free alternative treatment plan here. Q : What are the risk involved with alternative cancer treatments? A : Alternative cancer treatments have lower risk than conventional treatments and can be combined to increase favorable results. Read more about Oasis of Hope survival rates here. Q : Are the doctors at Oasis of Hope certified doctors or are they alternative medicine practitioners? A : Doctors at Oasis of Hope are certified medical surgeons that additionally practice alternative treatments. Dr. Francisco Contreras is a renowned alternative cancer treatment pioneer. Learn more about Dr. Contreras and other cancer doctors at Oasis of Hope here. Q : I’m already undergoing medical cancer treatment, can I change to an alternative treatment or do I have to wait until my medical treatment is finished? A : You don’t have to wait, alternative cancer treatments can be administered simultaneously while any other type of treatment is also being done, and in fact doing so will increase the success rates. 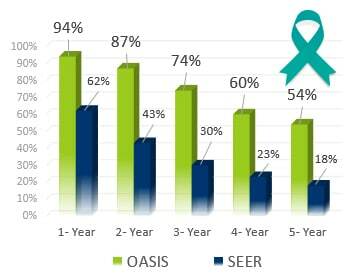 Learn more about Oasis of Hope survival rates here. Q : How can get more information about alternative cancer treatments at Oasis of Hope? A : The easiest way is to fill out the form on the right-hand side of this page screen or you can also call us free of charged at +1 619 690 8409.